Heat gas or charcoal grill. Cut 2 (18x12-inch) sheets of heavy-duty foil. Place tomatoes, garlic and red pepper flakes in blender. Cover and blend until smooth; set aside. In large bowl, mix beef, bread crumbs, onion, salt and egg. Shape mixture into 12 (2-inch) balls. Press 1 cheese ball into center of each meatball, sealing it inside. Divide meatballs evenly between sheets of foil. Pull up all 4 sides of each sheet of foil. Pour sauce over meatballs. Wrap foil securely around mixture. Pierce top of foil once or twice with fork to vent steam. Place packs on grill seam sides up over medium heat. Cover grill; cook 20 to 25 minutes or until meatballs are thoroughly cooked and no longer pink in center. Remove packs from grill. Carefully fold back foil. Sprinkle with basil. Serve meatballs and sauce over cooked spaghetti with Parmesan cheese, or serve as an appetizer. Can’t take the heat? Reduce the red pepper flakes to 1/2 teaspoon. Grilling burgers, dogs and brats, too? 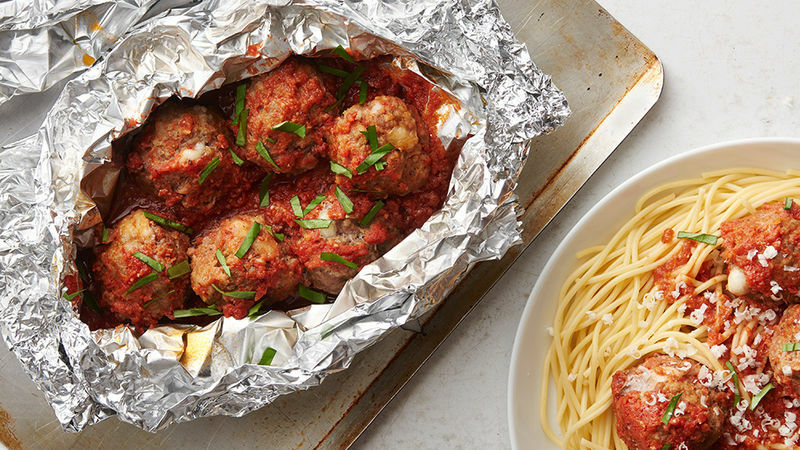 These meatballs hold well, unopened in their foil packs, in a 200°F oven for up to 2 hours.